Yeah, it seems to work now. Did that Summit of the Gods secret drain you that much? If so, my condolences. I am prone to almost everything... except spontaneous violence. raocow wrote: I know there is a population on Earth. They like to populate. I like to gesticulate. We're friends! I did say it on the spotzone! I finally got around to watching another one of these, and apparently Object Dreams is a thing now. I don't know if this one was ever brought up in past videos, but my favorite is the Sherlock Holmes story. And so, we move on to #4. Last edited by BobisOnlyBob on 13 Mar 2018, 19:01, edited 10 times in total. Thanks for that; I'll probably use that next time. So how's this whole Patreon thing been going for you, raocow? Life been treating you well? This has been one of my favorite years watching your stuff since the old SA days. We were all talking about that in the Discord thing a couple weeks back, but picking a favorite series of yours this year is going to be tough. Quick question: i just became a patron and was wondering how to get access to the patreon discord. Can anyone point me in the direction of it? Q: What exactly is the change that's being made? A: With this update, creators will now take home exactly 95% of every pledge with no additional fees. Q: Why is Patreon doing this now? A: Patreon exists to allow creators to get paid what they deserve to be paid, for the value they give the world. This is awesome and to continue this vision, we need to constantly evaluate our processes. As we work to deliver bigger and better features for creators and patrons in 2018, we felt like sooner than later made sense to put this change into effect. Q: How did you determine these rates? A: We standardized our fees because it helps creators by giving them more clarity and security regarding their earnings. Currently, creators can lose anywhere from 7-15% of their earnings to fees. This means that on the 1st of each month, creators might see their expected take-home drop. Creators often take home a lower percentage of their Patreon income than patrons may realize. Standardizing our fees across the board provides consistent expectations and more money for creators on Patreon. Q: What action do I need to take as a creator? A: As a creator, there are no actions you need to take at this time. The new service fee will be automatically applied to your patrons' pledges starting December 18th. You will see only 5% of earnings taken from your pledges from that date forward. Q: How does this impact my current pledges? A: Once changes take effect December 18th, a service fee will be applied to all pending retries and existing pledges. Patrons still have the option to cap the amount of paid posts they are charged for as noted here. Again, this service fee is standardized from the fees you paid as a creator - we've split between you and your patrons to ensure that you can better estimate your take-home pay. Q: What do I need to tell my patrons? In the past, I was covering Patreon’s 5% fee and all of the processing fees in full for all of my patrons. This meant that every month I saw anywhere from 7-15% of my earnings taken out to cover those processing fees. 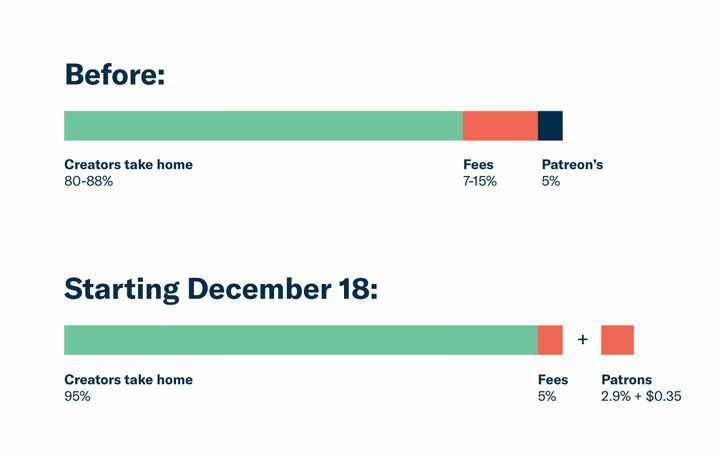 Starting December 18th, Patreon will apply a new service fee of 2.9% + $0.35 to each of your individual pledges. This service fee helps keep Patreon up and running and standardizes my processing fees to 5%. This ensures that creators like me keep more earnings in order to continue creating high-quality content. I hope you understand and continue your pledges on Patreon. You can read even more about the service fee here. Q: What if I want to take the hit for my patrons? Can I pay those fees? A: We understand that some creators might wish to take the hit for their patrons. That said, the service fee will be extended to all patrons on the site and there isn’t an option to remove the service fees from your patron pledges. The best step is to make sure your patrons are fully educated on the benefits of this change for creators and we’ve made sure to send them notification of this. Q: If my patrons have questions, where do I point them? A: If your patrons have questions, we’ve prepared a robust Q+A here so your patrons can get all the information they need. There's a section specific to your patrons below. Q: What action do I need to take as a patron? A: As a patron, there are no actions you need to take at this time. The new service fee will be automatically applied to your pledge starting December 18th. Q: When do the new rates apply to my monthly pledges? A: The new rates will apply to your monthly pledges starting December 18th so you'll see your first payment with the fee included January 1st, 2018. Q: When do the new rates apply to my per-creation pledges? A: If you are pledging to a per post creator, the service fee will be applied to your pending paid posts due during the billing cycle that begins January 1st, 2018. If you delete your pledge to a per post creator after December 18th, you'll see the service fee applied to any pending bills. You can check to see if you have pending bills due here. Q: How do these service fees help creators on Patreon? A: This helps creators by giving them more clarity and security regarding their earnings. Currently, creators can lose anywhere from 7-15% of their earnings to processing fees. This means that on the 1st of the month, creators might see their expected take-home drop. Creators often take home a lower percentage of their Patreon income than patrons may realize. Standardizing our fees across the board provides better expectations and more money for creators on Patreon. Q: Do I have to pay this new service fee? A: We have sent advanced notice so that you and all patrons have an opportunity to cancel your pledge if you no longer wish to continue your membership with the updated service fee. This fee gives creators more security as they can now better estimate their true earnings prior to the end of the month. This is vital for all creators, especially those that use Patreon to support their business full-time. Q: Is VAT included in the service fee? A: Value Added Tax (VAT) is not included in this service fee. If you are located in a country that charges VAT, you’ll continue to see this charge and be delivered VAT invoice on the 1st of each month. For creators, Patreon will continue to remit VAT on your behalf, as described here. Q: If I use my debit card, are the service fees different? A: The service is standardized for all payment types, so the rates are the same - even if you use a debit card to pay for your membership. Q: What other payment options are there for me on Patreon? A: Patreon will continue to have the option of paying via credit card or Paypal for their memberships. Since the service fee has been standardized, it will remain at 2.9% + $0.35 regardless of their selections. It might be a good change to give creators a more reliable estimate of their earnings after fees, but the chart claiming the creators' cut goes up from 80-88% to 95% is nonsense. They aren't necessarily giving creators a larger cut of the money pledged by patrons, they just stopped counting the fees in the denominator. In some cases (especially for creators who rely mostly on small individual donations, where the fee taken out represents a much larger percentage), their income could end up dropping depending on how patrons react to the fees. yeah I have to say I'm really disapointed with patreon over this. Normally up to now they've been actually kinda alright as far as companies go. I'm hoping that the very audible backlash makes patreon reconsider this, or make this optional. This is definitely designed to consume over a third of the $1 donations that, say, raocow's patrons really like to contribute. Good thing I'm a good boy and give $3. If I did my math right, $1 patrons now pay $16.55 a year, up from the $12. Or I become allowed to just mail checks.